The Macao Special Administrative Region, including the Macao Peninsula, Taipa Island and Coloane Island, is located south of Guangdong Province at the western bank of the Pearl River Estuary. It is contiguous to Gongpei of Zhuhai City, lying close to the South China Sea in the south. It is separated by a river from Wanchai of Zhuhai City in the west and faces Hong Kong in the east by the sea, with a distance of 42 nautical miles. There are passenger services of jet and other steamers between the two places. Its total area covers 23.5 square kilometers. The Macao Peninsular, Taipa Island and Coloane Island are connected by the Friendship Bridge, Macao-Taipa Bridge and a highway. Being subtropical in the typhoon zone, Macao has a warm and humid weather with plenty of rainfall. The hand-over in 1999 signaled the surrender of the final piece of Asian soil under European colonial control. In Macau itself, this colonial historical legacy is nowhere more obvious than at the site of the Bella Vista hotel. Once a glorious colonial style hotel, it is now the residence of the Portuguese consul. The Chinese government has promised to allow Macau to continue as it was before under the "one country two systems" policy. Macau has been made a designated Special Administrative Region (SAR) and the Chief Executive of the region is chosen by an electoral college consisting of local representatives. In practice the hand-over was surrounded by less pomp and circumstance than Hong Kong's hand- over in 1997 and day to day life in the region appears to have continued pretty much as before. Macao has a population of 420,000 , of whom 97% are Chinese, 11,000 locally-born Portuguese and over 2,000 Portuguese. This is an area with a fantastic mix of culture. The majority of the population is Chinese and the common language is Cantonese although Mandarin Chinese, English and Portuguese are all spoken too. The financial success of the region is due largely to the influx of tourists who come here to visit and to play in Macau's most famous sites: the Casinos. But casinos are not all that Macau is about. Until December 1999, Macau was Europe's oldest colony. As such, this is a city of amazing and fascinating cultural wealth. The unique blend of European and Oriental cultures existing here creates a pleasurable and laid back atmosphere in a truly beautiful city. Palm trees line the Portuguese named streets, Churches, Cathedrals and forts sit tight with ancient Chinese temples and buildings. The parks here are quaint and there are some great beaches and restaurants too. The most prosperous and impressive area of the city is around the Ruins of St. Paul's Cathedral, itself a symbol of the fusion of cultures existing in Macau. Located on the east side of the outlying island of Taipa, Macau International Airport (MFM) has convenient transfers between the air and ferry services in the region. The airport runway is on a narrow strip of reclaimed land and is connected to Taipa by two bridges. Flights leaving Macau International Airport take passengers directly to most destinations in this region and there are scheduled airlines between Macau and cities in mainland China including Beijing, Shanghai, Haikou, Diamond, Hangzhou, Nanjing, Shenzhen, Fuzhou and Hindu and Taibei and Gaoxiong in Taiwan as well as Seoul and Inchon in Korean, Bangkok, Manila, Singapore and elsewhere in Southeast Asia. Travelers can also catch connecting flights to other parts of Asia, Europe and America. The airport is a fifteen-minute drive from the Macau Ferry Terminal and a twenty-minute drive from the Barrier Gate. It is quite easy for travelers to either catch a ferry service to Hong Kong or take a land trip by bus to Guangzhou. For travelers who wish to enter Shenzhen, a five minute car drive from the airport via the Lotus Bridge will reach the border of Guangdong Province. A full range of facilities including shops, restaurants, enquiry counters, banks and postal services are available in the Airport Building. Taxis and the special airport line API provide passengers with a convenient means of transfer to city hotels, the Macau Ferry Terminal, the Barrier Gate and other venues. For ticket reservations, please dial 86-853-3965555. Air Macau counters are located on the 2nd floor of Airport Building (Departure) and No. 398 Alameda Dr. Carlos d'Assumpção, R/C in the city area. Express Bus is a new a time saving service which provides a quick Land-to-Air or Air-to-Land transport service between Macau International Airport and Macau Ferry Terminal by freeing Express Bus passengers from immigration and custom procedures and luggage handling. Travelers on their arrival at Macau International Airport should follow the sign board for the Express Bus Service and purchase tickets at the airport counters where a blue-tag will be provided to label check-in luggage. Then travelers go direct to the Air-to-Land transfer to Macau Ferry Terminal and take ferry service to their final destination thus avoiding immigration and custom procedures. Then it only remains for them to collect their luggage with blue tags at the terminal at their destination city. Travelers taking the ferry service from Hong Kong or Shenzhen, on arrival in Macau Ferry Terminal, can follow the signs to the terminal counters in order to buy tickets for the Express Bus Service. A blue-tag will be provided to label check-in luggage. Then travelers can board the Land-to-Air transfer to be taken to Macau International Airport and on to their final destination without any immigration and custom procedures. Then it only remains for them to collect their luggage with blue tags at the terminal at their destination city. Outside the Airport Entry Building, Airport Bus Nos API, 26 and 21 take passengers to the Barrier Gate or the outlying island of Coloane. There are also Cross-Boundary Bus services outside the Arrivals Building. There are tourist buses to take passengers directly to major cities in Guangdong Provinces. Taxis can also be found outside the airport building. For more information on taxi fares, please visit our Getting Around section. Helicopters run by East Asian Airlines and Hong Kong Helicopter company, ply between helipads on the Macau and Hong Kong Ferry terminals. The short trip takes only sixteen minutes and the flights from Macau to Hong Kong operate between 9:00 to 22:30 and those from Hong Kong to Macau are available from 9:30 to 10:59 at an interval of 30 minutes. Moreover, helicopters leave from Macau Ferry terminal to Shenzhen Bao'an Airport at 9:45, 13:15, 14:45, 16:45 and the trip takes around 20 minutes. Helicopter services from Shenzhen to Macau are available at 11:45, 14:15, 15:45, 17:15 and 20:30. Booking & Enquiry: 86-853-727288 (Macau), 86-852-21089898 (Hong Kong). There are many scheduled ferry services between Macau and Hong Kong providing travelers convenient transport between these two island regions. Quite a number of jetfoils and Catamarans are available, which differ in speed, comfort and price. There are two ferry terminals in Hong Kong providing ferry services to Macau. One is Hong Kong-Macau Ferry Terminal, located in Shun Tak Centre, on the waterfront west of Central District on Hong Kong Island. The terminal has its own passenger wharfs, helipad and bus and minibus terminus close by. Many hotel and travel agents' reservation offices can be found in the terminal. The Turbo-jet Sea Express project initiated by Macau-Hong Kong Ferry Terminal makes the ferry trips between Hong Kong and Macau somewhat easier. Another choice is the China Ferry Terminal, located on the Tsim Sha Tsui waterfront alongside Harbor City, on the Kowloon side of the harbour. They have Catamaran sailings to and from Macau. The trip takes about 70 minutes. Travelers can either take ferry service at Macau-Hong Kong Ferry Terminal or China Ferry Terminal in Hong Kong to Macau. There several transport choices from Hong Kong International Airport to Macau-Hong Kong Ferry Terminal. You can take the Airport Express to Hong Kong Central Station. The bus leaves at ten minute intervals from 5:50 to 0:48 (next day). From Shenzhen to Macau. Shipping Co. Ltd has ferry services running between Shenzhen and Macau daily and the single trip takes around one and half an hours. The boarding address in Shenzhen is Fu Yong Ferry Terminal (Shenzhen Airport) and the boarding address in Macau is at the end of Av. Almeida Ribeiro, Rua das Lorchas, near the Master Hotel, pier 14. A more popular choice would be the Turbo-Jet Sea Express departing from Shenzhen She Kou Ferry Terminal to Macau, which takes about one hour. Passengers can buy Turbo-Jet tickets either at the ferry counters or at counters in Macau International Airport. Passengers are advised to be at the terminal at least one hour before the scheduled departure time, in order to complete immigration formalities. Turbo-Jet Sea Express is a new time saving project initiated to provide tourist quick ferry transport between Hong Kong International Airport, Macau International Airport and Shenzhen Bao'an International Airport. Passengers from Macau and Shenzhen who take flights at Hong Kong International Airport can avoid Hong Kong Immigration and Customs formalities and their luggage will be delivered to their destination ferry terminal. There are two gateways to the China's Guangdong Province from Macau. One is Barrier Gate on the borders on Zhuhai and other is the COTAI Frontier Post at the end of the Lotus Bridge on the island of Taipa. Barrier Gate, located at the northern end of the Macau is the main entry gate to Zhuhai in Guangdong Province. It is the gate by which travelers from Macau enter mainland China. Actually all bus services operating between Macau and Guangzhou pass through this gate. All travelers are required to have the same travel documents (for example your valid passport and(Chinese visa ) which are required when entering China via other cities such as Beijing, Shanghai or others. Its operating hours is from 7:00 to 24:00. Gongbei Border, nine kilometers away from Zhuhai city's government center, is a Chinese border immigration checkpoint. It connects Macau to the south and several hundred meters from its counterpart, the Barrier Gate of Macau. The operating hours is from 7:00 to 24:00. There are air-conditioned buses operating between Macau and Guangzhou, which should pass the Barrier Gate and Gongbei Border. The place to board these buses is the Kee Kwan's Company bus stop, close to Master Hotel in Macau. However, the bus company is not responsible for Chinese tourist visa which travelers have to hold in order to cross the border from Macau to Zhuhai. Make sure to get all your documents well prepared for border crossing. For travelers who have not yet applied for their Chinese visa, the alternative is to firstly exit Macau from the Barrier Gate and take immigration formalities at Gongbei Border, and then catch the buses at Gongbei to Guangzhou. In addition to the Barrier Gate, COTAI Frontier Post at the end of the Lotus Bridge in Cotai on the causeway between the islands Taipa and Coloane is the second entry to China's mainland. Their working hours is from 9:00 to 20:00. However, from September 17, 2005, this gate will be closed for one year for maintenance. TRANSMAC and TCM are the two bus companies operating all public buses and mini buses in the city. Bus lines cover almost all the attractions and hotels on the Macau Peninsular and the main tourist spots on the outlying islands of Taipa and Coloane. The bus routes operate on a one-way circuit around the city. This means you would not necessarily have the same stops on a return trip. Ask the bus drivers for details. Most public buses are air-conditioned middle-sized vehicles capable of carrying more than 20 people. There are no conductors so it is necessary for you to have the appropriate change in coins before getting on a bus. Several bus lines going further to the islands of Taipa and Coloane charge three to five Macanese dollars. The operating hours of most buses are from 6:00 to 24:00. Tip: We suggest travelers try to avoid the peak morning and evening traffic periods when people crowd onto buses to go to work or return home. All bus stop signs have bus route descriptions in both Chinese and Portuguese. English versions of the local map can be obtained from the counters of the Macau Tourist Bureau on Senado Square in the downtown area of the city. A taxi trip from the Macau Peninsular to the outlying islands of Taipa and Coloane costs extra five Pataca, in addition to the meter and for the taxi trip from Taipa to Coloane, two Pataca is surcharged. However, no surcharge is made for any return trips from outlying islands of either Taipa or Coloane to the Macau Peninsular. Local maps with information in Chinese, Portuguese and English are supplied to taxi drivers by the Macau Tourism Administration Bureau so that they can communicate with visitors about the places and routes in the city. Macau is a small city that enables tourists to enjoy their visit by means of special tourist vehicles that include pedicabs and a replica of an old-style 1920s English bus. In the Municipal Garden in the Taipa Village, there are some bicycle rental shops that provide for cycling tourists. 400 years ago, Portuguese traders brought capsicum, curry, shrimp paste and pickled lings from Africa, India and Malaysia to Macau when they first set foot there. When, these exotics were blended with native vegetables and seafood the local people created the singular taste of Macanese cuisine the like of which can be found nowhere else in the world. The popular Macau dishes include Bacalhau (dried codfish, a Portuguese favorite), African Chicken, Galinha Portuguesa, Linguado Macau, Paella and Clam Stir-fried with Garlic. Wine and good food brings out the best of each other and Portuguese wines are an excellent accompaniment to the delicious Macau cuisine. Serradura is a famous after dinner sweet that is considered to be a favorite with a majority of people who live in or visit Macau. 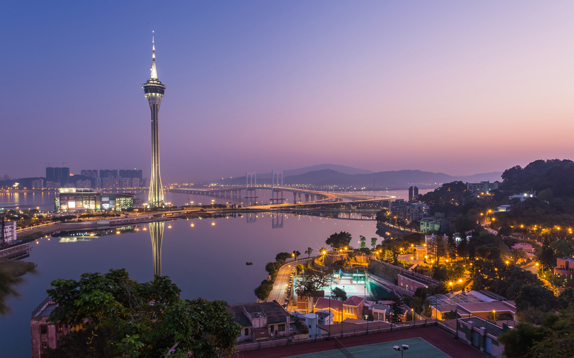 Macau, as a free port favored with a low-tax policy and a considerably stable currency, is a popular shopping region with tourists and Hong Kong residents, who come here to snap up cheap wine and tobacco. A selection of reproduction traditional-style rosewood Chinese furniture, porcelain wares, lacquer, bronze wares, wood carvings and Chinese paintings can be found in Rua de S.Paulo Area. Of course, Macau is a good place to buy aromatic authentic Douru or Alentejo wine imported from Portugal at duty-free prices. Vinho Tinto in Portuguese on wine bottles indicates the red wine and Vinho Branco the white. Macau Wine Museum is the best place to sample different types of wines and get professional advice on how to buy wines. Well-packed wine products are available at all supermarkets. Gold, pearl and crystal jewelries can be found either in credit standing jewelry shops and souvenir stalls on the antique street near the Ruins of St. Paul's. The credit standing jewelry shops are mainly located near the New Road Area, Av. de Horta e Costa and the region close to Hotel Lisboa. The Macau-style Dim Sum is well-known throughout South East Asia. Pastry shops and dim sum bakeries in the Senado Square Area and Rua de Cunha offer ideal gifts for families and friends. For details, please see our page on Macau Snacks. Numerous world-famous fashion brands have stores and outlets in the city providing all the latest styles and fashions. Top of the range fashion shops can be found around the areas close to the New Road and Av. Infante D. Henrique. The luxury hotels such as Hotel Lisboa, Mandarin Oriental, Sintra and New Century in Taipa have boutiques selling fashion clothes, duty-free perfumes, cosmetics and electronic accessories. Tips:It is always best to purchase brand name cameras and electronic appliances in shops of good standing (Certified Shops) and remember to ask for the quality certificates and receipts in event of any after sales problems. In addition to top-ranking fashion shops housed in luxury hotels, there are many clothes and footwear shops that sell both formal and casual wear ranging from men's suits to women's summer accessories. Traditional styles of Chinese clothing are very popular with many tourists. You can find shops that sell Chinese style clothing in the area around Rua Mercadores in the Senado Square Area or the Red Market Area. Tips: Small shops do not have fitting room facilities for Customers, so it is vital to make sure you choose your correct size because refunds are not given on items of clothing. The Consumer Council of the Macau government has launched a quality initiative program in the city by granting 'Certified Shop' status to those who have a record of no customer complaints since 2001. Customers buy goods in the shops that participate in this program can obtain free arbitral service at the Customer Arbitral Center in the event of any disputes over purchases. With an average annual temperature of just over 20° C (68° F) and a yearly mean variation between 16° C (50° F) and 25° C (77° F). The humidity is high with an average range between 75% and 90%. Rainfall is also high with the yearly total between 40 and 80ins. The best season is autumn (October-December) when days are sunny and warm and the humidity low. Winter (January-March) is cold but sunny. In April, the humidity starts to build up and from May to September the climate is hot and humid with rain and occasional tropical storms (typhoons). 999 is the emergency number for the police in the city. You can dial 112 toll free for the police's special tourist hotline. For mainland China please dial 110. For the fire department, dial tel. 86-853-572222, a toll call. Visas are not required for those holding passports from Australia, Austria, Belgium, Canada, Denmark, France, Greece, Italy, Japan, Malaysia, Netherlands, New Zealand, Norway, Philippines, Spain, Sweden, Thailand, Britain, USA, South Korea, Singapore, Luxembourg, Ireland, Brazil, South Africa, India, Mexico and Germany. Visitors from these nations may stay for up to 20 days. Hong Kong residents with 3-star ID cards may stay for up to 90 days. Taiwan residents do not require a visa but do however, require a valid passport and entry permission for Hong Kong. Taiwan residents are permitted to stay in Macau for up to 20 days. With the exception of routine inspections, customs declaration is not required for entering or leaving Macau. Imported electric appliances should have a 5% tax paid. Duty free articles include gold objects, antiques and cameras. Foreign tourists are permitted to take one liter of spirits and 200 cigarettes or 50 cigars. Most people in Macau speak Cantonese. Mandarin is becoming more popular and many people speak Portuguese and English too. The currency unit of Macau is PATACA with denominations of 10, 20, 50, 100, 500 and 1000 Patacas in banknotes and 10, 20, 50 avos and 1, 2, 5 and 10 Patacas in coins. Hong Kong dollars are readily accepted everywhere in Macau. Most hotel rates are generally quoted only in Hong Kong dollars. The rate is fluctuates with the currency market. The exchange rate is about MOP$103 = HK$100 and One Hong Kong dollar is considered the same value of its Macau equivalent in practice. Roughly eight Patacas is equivalent to one US Dollar. Hotels, banks, casinos, numerous money changers in the city provide money exchange services and travelers' checks are acceptable at hotels. Macau International Airport and the Lisboa Hotel, famous for its casino, provide 24-hour money exchange services. The hygiene and medical conditions in Macau are quite good. Several public and private hospitals in Macau provide adequate medical care and facilities for residents. On-the-spot payment is expected in hospitals by local custom. Public telephone kiosks are available throughout the city at one Pataca coin for five minutes. All telephones in hotels or public kiosks have IDD service. The country code for Macau is 853 and you need to dial 001/853 before the number if calling from Hong Kong. When dialing an international number from Macau, you should first dial 00 and then add 853 and the number you want to call. Mobile phone rental services are provided by Macau telecom companies. Please dial 1000, 1118 or 1628 to for enquiries. The main post office is located in an old Euro-style building in the downtown area on the main square, Largo do Senado. Different counters in the lobby provide various language services. Most of them provide Cantonese and English. In front of each counter window, there is a small board indicating the language the counter provides. One thing you should bear in mind is that in this postal office, RMB is not acceptable. The office is open on Monday to Friday from 9:00 to 18:00 and Saturday from 9:00 to 13:00. Mailboxes in Macau are red. Macau publishes journal and weekly newspapers in Chinese, Portuguese and English. However, all TV programs are shown in Chinese and Portuguese.